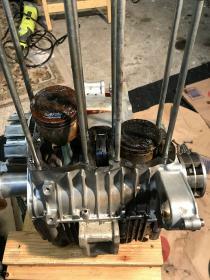 CB500T Engine - What a Mess! 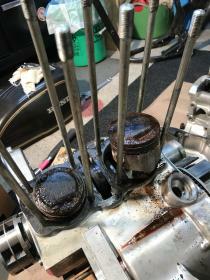 Thread: CB500T Engine - What a Mess! My 450 was in a similar state. Frozen after sitting almost 30 years as well. Head and cylinders are at the machine shop now. It's hard to see from your pictures how deep the corrosion is on the clutch basket. Is is superficial or are the teeth in bad shape? 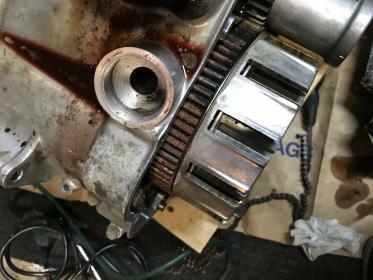 We can see the alternator rotor in the pics and it looks fine... Did you mean the steel core of the stator windings? More pics (and closeups) of the various angles of the engine would help. You'd be surprised what can be cleaned up and still serviceable. Unless the pistons are scored badly and out of specs as they are now, I would clean them up and see. Hell... My own CB500T engine didn't look much better when I first got it and I managed to reuse almost all of its parts in rebuilding. You would be shocked regarding those pistons. I bet all the rust is from the iron sleeve, not the piston.